The secret to thriving in the Sandwich generation, the time when you're pulled between your aging parents, young children, and your career. 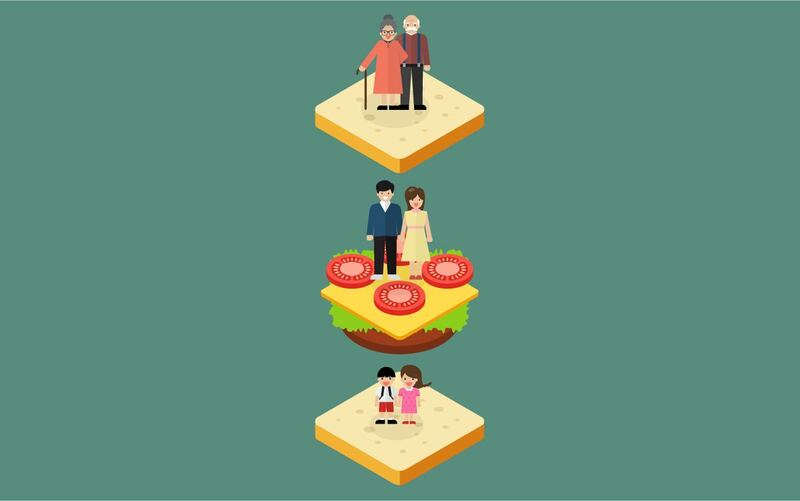 You hear about the Sandwich Generation when you’re younger: the time in your life when you are sandwiched between raising your own children and then taking care of your aging parents. You’re pulled in every direction. You go from business meetings to soccer practices, to scheduling kids’ appointments or play dates to helping out your parents with tactical “projects” that all require planning and execution. Yet this is the time when your career momentum is at its peak and your work demands are higher than ever. Balancing your time and energy across all your responsibilities is a perpetual challenge. You know the people who you love the most are all depending on you. Yet those at work also need your time and attention to be successful. That feeling of always being sub-optimized or deficient in one area or another weighs heavily – you want to give it your all in everything but there isn’t enough time, energy and you to go around. As a mother of two, business owner, and family problem-solver, I’ve been working on finding that elusive balance for years. But I’ve learned that you really can’t do it all on your own. When you stretch yourself too thin trying to take care of everyone else and manage your career, your health and happiness decline, you burn out, and you ultimately can’t serve anyone. At the first signs of sandwiching, realize it’s time to restructure. Manage your personal life to the same degree, as a business: organize, streamline and delegate wherever possible. Look for opportunities to partner up, share responsibility, or if need be, hire a specialist. Identify those subject matter experts within and even outside your network as these valuable resources can come from anywhere. Accept that you don’t have to problem-solve, plan and execute all on your own. Find that tutor for your kids, figure out a carpool system, allocate tasks to others in the family or to friends. If you need to hire help for whatever you need, then just do it. Keep delegating. Don’t let it all fall on your shoulders. Get creative with your problem-solving and invest where you need to. Just like work situations, solutions can come from places that you wouldn’t expect. Think outside of the box to create an effective village to help you with your day-to-day operations. Those in your network have capabilities (or time) beyond what you currently know them to have. Tap into them, leverage their expansive strengths and abilities. Triangulate opportunities that help you thread together new ways of working. And it doesn’t have to be expensive. Maybe your brother has time to schedule and drive your mom to her doctor’s appointments. And your neighbor’s son is a math whiz who will happily tutor your daughter in exchange for access to your pool. Or your child’s former teacher could be a tutor or even babysitter or caregiver. Maybe your other child’s music or art teacher could help with creative projects at your work. And if you need to financially invest in support (and can afford to do so), do it. That tradeoff between time, money and value is important for your own sanity. The investment will be worth it. If you keep trying to do everything yourself, you will break. When that happens, things fall apart, and you lose more than money. Your village is not an evasion of all of your responsibilities. You are still there for your family. With weight lifted off your shoulders, you will be able to give them your full attention when it’s needed. Focus on being the manager and spend less time in execution. Create your team, execute against your plan, and you’ll find that your operation is running smoother and more efficiently than you imagined. You can continue to excel in your career while also ensuring that the people you care about the most are in the best hands.